Sassy Studio Designs "Go Green, It's Spring"
Hello! 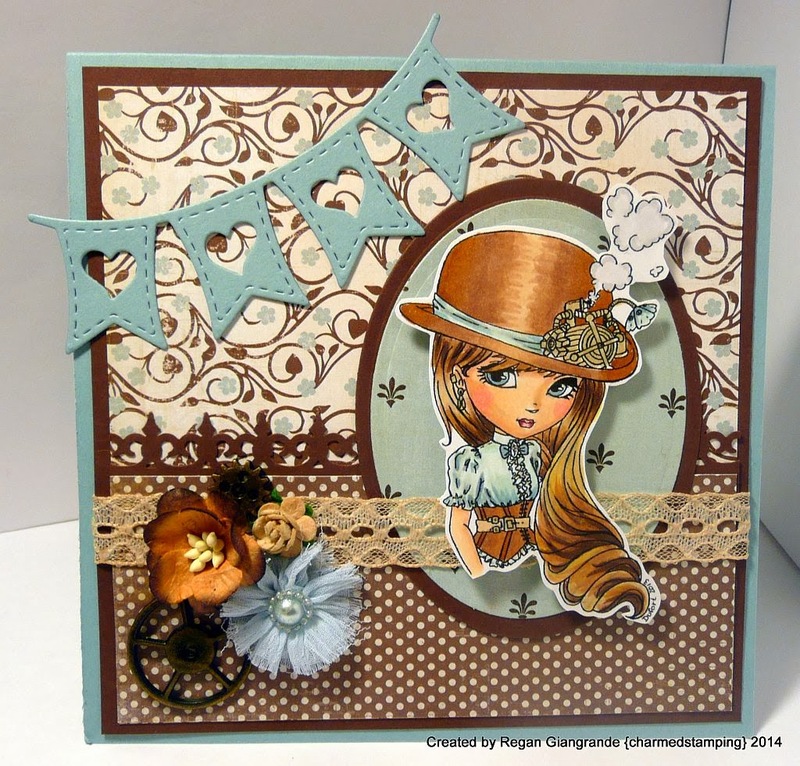 I'm just popping in to share a card I made for my lovely crafty friend Susanne in Sweden! This is our second card swap, and I was really excited about it! I selected an awesome JadeDragonne image to work with. 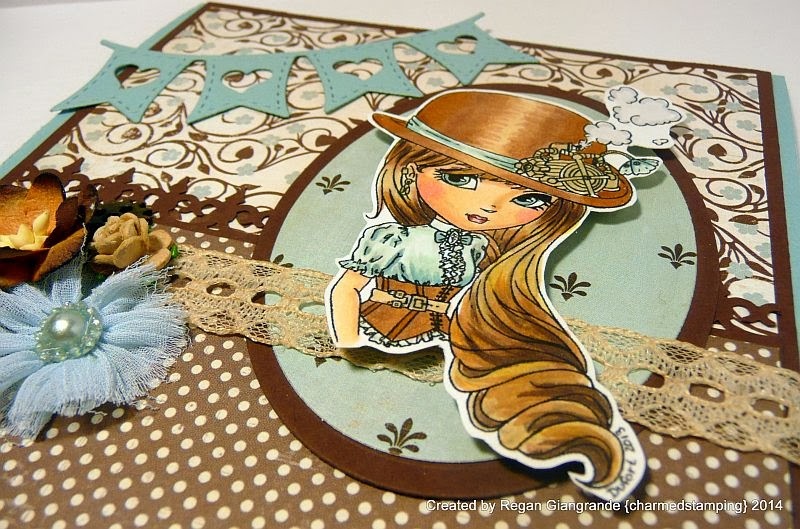 This is Steampunk Hat, and she's colored with Copics, fussy cut, and matted using Classic Ovals Nestabilities from Spellbinders. And despite the title of my blog post, I'm pretty sure she took a jet fueled, and not steam powered, ride across the Atlantic! The layout is courtesy of Stempelsonnen Challenges (#109). I am just linking it up now due to the time it took my card to travel overseas, but I'm glad I made it with a few hours to spare! It's a great design and was fun to work with! Papers are My Mind's Eye - Six by Six: Paris & Co. I was SO excited to use my new La-La-Land Crafts Heart Banner die! I sponged some lace with Vintage Photo Distress Ink and added flowers from my stash as well as a couple of Tim Holtz metal gears. The border punch is Martha Stewart. Susanne messaged me to let me know she loved the card! I am still waiting on hers to arrive, which is ironic since she sent hers before I did. I guess you just never know when customs is involved. I will be stalking my postal carrier until it lands in my mailbox! Before I say goodnight, I have some amazing news to share that I am super excited about! Many of you know that I love Krista Smith's Saturated Canary images. She recently had a giveaway on her blog for a custom clock, designed in collaboration with the winner, and created by Krista herself! Well, guess what?! I WON! OMG, OMG, OMG! I am over the moon and cannot wait to start working on it with her! Thank you, Krista, for being such a sweet, generous soul, for sharing your talent with the world, and for just being so darn fun! Thanks for stopping in to see what I've been up to! I had better do some crafting tomorrow because I have an order due and important birthday cards to get done. Markers used: Copics (E00, E11, E21, E23, E25, E27, E31, E37, E79, R32, R39, BG10, BG72, N0, N2). Wow! Was für eine wundervolle Karte! Ich bin begeistert von dem tollen Werk. Danke daß du bei der SsC mitmachst und meinen Sketch so fabelhaft umgesetzt hast. Wow.. so wonderful creation... perfect lovely styling.. Thanks for joining us at Stempelsonne. Wow! The card is Fabulously beautiful! like it very much and I like the color combination. Thank you for your contribution to the SSC. Such a cool card! You did a great job! Love the peek of the inside too! Super cute image and a darling card. 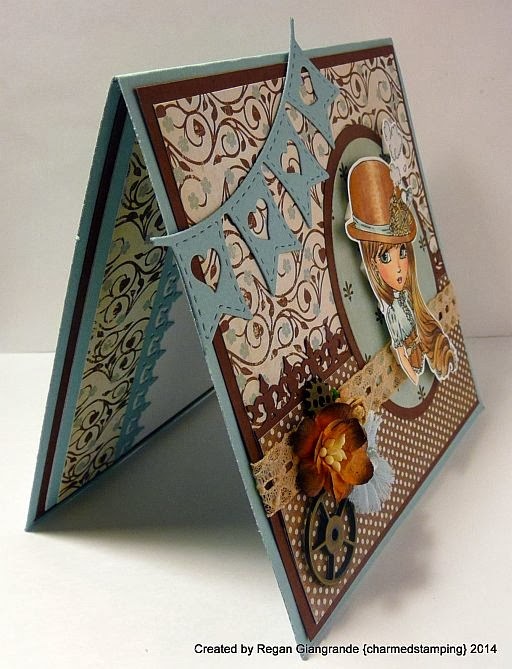 Love your new banner die and love the embellishments and design of your card. Your coloring is absolutely stunning!! !